I presented this webinar live recently in my quality as DxO Image Master and being invited by DxO to talk about what I love most: Black and white fine art architecture. The 1000 available spots for the webinar were sold out in just a few days and the attendance was maximum. Now the webinar is featured on the Tutorials page of DxO where other great photographers share their knowledge too. The video can now be watched directly on YouTube. The feedback I received after the webinar was overwhelming, thank you all for the fantastic support and good words. If you couldn’t attend the live event, you can watch the most important parts of the 2 hours webinar in an hour and ten minutes long version made by DxO. The webinar can be watched also on the official Tutorial DxO Page. I’m showing how to use DxO OpticsPro, DxO ViewPoint and DxO FilmPack to create compelling black and white photographs, architectural but not only. The principles can apply to any kind of fine art photography. You can also subscribe to my YouTube Channel where you can find the webinar featured if you want to be notified about my future video tutorials. I periodically publish videos about the creation and processing of my black and white images where I share my photography vision, composition principles and black and white processing tips. MORE NEWS – STAY TUNED! I’m currently working on a written tutorial for DxO that will be published very soon. The tutorial will present how I process one of my images to create (en)Visionography by using DxO, Photoshop and my black and white processing method Photography Drawing. If you want to be notified when the tutorial will be published you can subscribe to my website and you will receive an email with a link to it. Also working on 2 new photos, one from London, for my series EQUIVALENTS, and one in a new series, from Chicago. You will see both images very soon with tips about how I created them. If you work with the DxO software and especially with FilmPack you will surely like the preset series I created for this plugin. 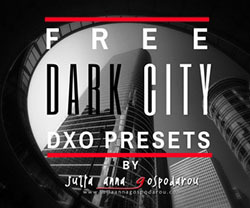 The presets, originally launched in 2014, have been updated and enriched with more presets and this is the new FREE extended 2017 version of the original fine art DxO Preset Series Dark City. Download the presets by clicking on the link or on the image below. Posted in Gear Software Reviews, Tutorials Fine Art Black and White Photography. RSS 2.0 feed.